All FAWNGROVE homes currently listed for sale in Park City as of 04/19/2019 are shown below. You can change the search criteria at any time by pressing the 'Change Search' button below. 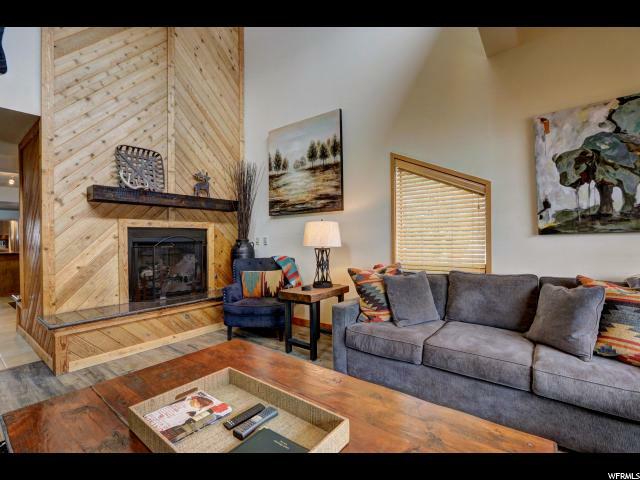 "Enter into a permanent vacation with this beautiful mountain lodge condo! This highly desirable location is absolutely perfect for the escape from the everyday. Open the door, and step into the open and spacious ranch-style kitchen/dining room featuring miles of granite counter tops, stainless steel appliances and bar stools that are ideal for those large family get togethers. The kitchen seamlessly connects to the main dining area and onto the main living space. In the living room, get ready for hot chocolate and warm blankets to cuddle up in comfort next to your large double-sided shiplap fireplace! Boasting vaulted ceilings and an open balcony above, this entertaining space feels much larger than you expect. Also claiming real estate on the main level are two large bedrooms with a full bathroom to accommodate all your guests. Each bedroom has plentiful natural lighting to brighten up the space. As you head up the stairs, you will enter the charming master bedroom with ample closet space, tv hookups, and an electric fireplace to warm up the atmosphere. A magnificent master bath is just off to the right and is decorated with intimate lighting, stand in shower and a jacuzzi bath to sink into after a long day of work. This amazing get away is one of the most amazing places to escape from the everyday or the mountain side after a long ski day. Call to come see it today! Storage closet next to parking space. Flooring is waterproof luxury vinyl tile."